Georgia's coastal islands play a significant role in the maintenance of populations of wading birds such as herons, egrets, and ibises. Most of the islands have sloughs and ponds which are highly preferred for nesting. In addition to suitable habitat, the islands provide secluded nesting areas with minimal human intrusion. Several colonies of moderate size occur on the Georgia coast. Ten rookeries and colonies were detected by aerial surveys during the summer of 1970 and are described briefly in the list that follows. Many of the nesting sites were visited by foot or by boat. Previous nesting information on some of the rookeries and colonies is included for historical perspective. The nesting sites are listed and described from north to south along the coast. The numbers preceding the rookery or colony names indicate the location of that nesting site on Fig. 34. Location: lat. 31°55', long. 81°07', Petit Gauke Hammock Island, Chatham County, 1.5 miles southwest of Vernon View. This rookery, which can be seen from the intracoastal waterway, consisted primarily of Great Blue Herons and Common Egrets. Nesting sites were commonly 30-40 feet above ground in pine trees. Nesting was near completion about mid-July. Location: lat. 31°47'35" long. 81°07', 3.1 miles south of Ossabaw Island Landing on Ossabaw Island, Chatham County. A 1.5-acre submerged field surrounded by mature live oak and pine trees provided the habitat for this colony. Nests were located in willow, cabbage palmetto, and buttonbush. There was no discernible nesting sequence for the eight species using the rookery during the summer of 1970. Over 90% of the nestlings were fledged by mid-July. Location: lat. 31°47'34", long. 81°07' 3.6 miles south of Ossabaw Island Landing on Ossabaw Island, Chatham County. 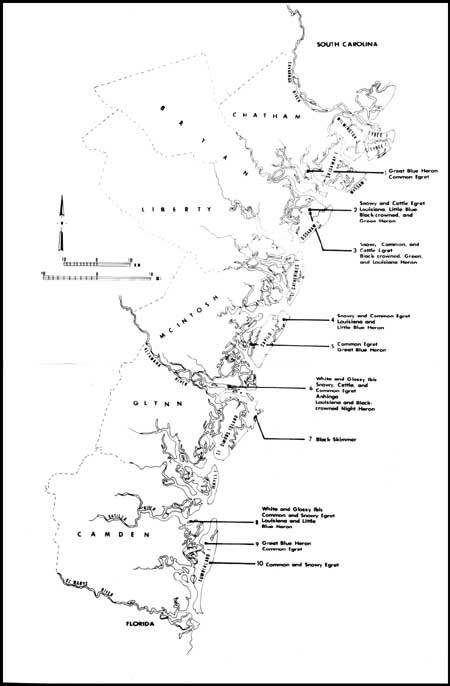 The largest concentration of nesting wading birds on Ossabaw was located here. This area has been frequently used as a nesting site for wading birds since at least 1915 (Erichsen 1921). Nest sites were in willow trees and myrtle bushes. Egret Pond consists of about three acres of open water surrounded by mature pines and hardwoods. The water depth was from 1-4 feet in the area of the colony. Pickerel weed and duckweed occurred in dense clusters beneath the nests. High juvenile mortality seemed to occur during the latter stages of nesting. Causes of this mortality were not evident. Excessively low passes by helicopters from nearby Hunter Army Airfield may have contributed to the mortality. Location: lat. 31°30'40", long. 81°11'30", Blackbeard Island, McIntosh County on northeast side of island. Nearly 250 birds made use of this area as a nesting locale. Nests were located in shrubbery adjacent to and within small freshwater ponds. The estimates below are based on visual observation and photographs. Cattle Egret, White and Glossy Ibis were observed, but there was no evidence of their nesting. Location: lat. 31°26'30", long. 81°17'30", 3.7 miles southeast of Valona, Ga., on west side of Duplin River. Despite the presence of a pond near the center of this hammock and its use by many species as roosting sites, nesting took place several yards to the north, high in pine trees. Only Common Egret and Great Blue Heron nests were located. Nests were 30-40 feet above ground. Fledging was completed by the first week of July. Wood Ibis, Yellow-crowned Night Herons, Black-crowned Night Herons, Louisiana Herons, Cattle Egrets, Snowy Egrets, and White Ibis used the vegetation surrounding the nearby pond as roosting sites. Varying numbers of these species were present throughout the summer. Location: lat. 31°20'02", long. 81°22'29", 1 mile east of Rabbit Island near the mouth of the Altamaha River, McIntosh County. This colony was first entered on May 14, 1970. At this time nests of most species contained eggs. Only Common Egret, Anhinga, and Black-crowned Night Heron had well-developed young. Low-level nesting predominated. White and Glossy Ibis made nest depressions from broken and bent Spartina grass. These structures were generally 7-18 inches above ground level. The remaining species nested mostly in bushes from 2-5 feet above ground. Two nesting periods occurred during the summer of 1970. The first White Ibis and Glossy Ibis nests were destroyed by high tides and winds late in May. White Ibis made a second nesting attempt 2-3 weeks later. Young were fledged during mid-July. No Glossy Ibis young were known to survive the storm of late May. (This is the first record of Glossy Ibis nesting in Georgia and is documented by photographs of nests, eggs, and young.) A few late-nesting attempts by Louisiana Herons and Snowy Egrets occurred during late June. The nesting sequence may loosely be ascribed as follows: (1) Common Egret, Anhinga, Black-crowned Night Herons; (2) Snowy Egret, Louisiana Heron, Cattle Egret; and (3) White Ibis and Glossy Ibis. Evidence of heavy mink predation was noticed in this colony. Numerous dead young birds were found on each visit to the rookery. Despite the presence of a small number of "gator holes" no alligators were seen. Location: lat. 31°16', long. 81°16'50", Little St. Simons Island, Glynn County. The abandoned Black Skimmer colony of Little Egg Island (c.f.) appears to have relocated at this site. Approximately 110 skimmers were observed from the air. Nesting occurred on high beach dunes. On 12 August a small but undetermined number of young could be seen. No evidence of tern nesting was found. Location: lat. 30°58', long. 81°29'30", 4 miles southwest of Jekyll Point on the Satilla River, Camden County. This island had the largest nesting congregation of wading birds on coastal Georgia. This treeless marsh island is approximately 1200 yards long and 250-300 yards wide. Three-fifths of the island is submerged by spring or storm tides. The figures below are based on aerial photographs and observations prior to a storm in late May which resulted in high tides and winds that destroyed about half of the White Ibis nesting sites. Following this, the number of nesting birds was approximately that of the Darien Rookery. By 16 June 1970 most young were near fledging; however, all species except Black-crowned Night Herons had some late nesting attempts underway. Cattle Egrets and Yellow-crowned Night Herons were not present. The absence of adequate feeding habitat nearby may have prevented Cattle Egret nesting. One Glossy Ibis nest containing one egg provided the second nesting record for this state. Mink predation was evident throughout the rookery. Aerial observation on 8 July revealed several Turkey and Black Vultures, and two young Bald Eagles in the rookery. Location: Small ponds on the north and west sides of Cumberland Island, Camden County. Two small pond sites were used as nesting locations by Great Blue Herons and Common Egrets (personal communication of C. William Dopson and James I. Richardson). No estimate of the individual species was given. Location: lat. 30°52', long. 81°26', 2-3 miles from the north end of Cumberland Island on the eastern side. This relatively small colony was located during an aerial survey on 16 May. Nesting sites were in trees and bushes surrounding a 1-acre pond. Species observed included Common Egrets and Snowy Egrets. The colony appeared to include about 160 birds. Location: lat. 32°02'15", long. 80°53'20", Tybee National Wildlife Refuge, Chatham County. No observations of this site were made during the summer of 1970. In the past, however, Oyster Bed Island has been a nesting site of Least and Royal Terns and Black Skimmers. Periodic deposition on the refuge of spoils from dredging operations by the U.S. Army Corps of Engineers serves to maintain feeding and nesting habitat for these and other migratory birds. Nesting by the above species is most common immediately following spoil deposition. No information is available regarding the size and relative composition of the nesting colony. Location: lat. 30°30'40", long. 81°14'20", Reynolds Duck Ponds, Sapelo Island, McIntosh County. R. J. Reynolds, former owner of Sapelo Island, constructed freshwater ponds at the north end of the island which developed into suitable nesting habitat for wading birds. By 1958, 2500 pairs of White Ibis, 75 pairs of Black-crowned Night Herons, 100 pairs each of Common Egrets and Snowy Egrets, and 50 pairs of Louisiana Herons were nesting there (Kale 1965). Since that time, cattails have covered nearly all of the pond, and herons no longer nest there. Proposed programs of the Georgia Game and Fish Commission to restore the area to habitat suitable for waterfowl may result in reestablishment of the rookery. Location: lat. 31°19', long. 81°18', Little Egg Island between Egg Island and Wolf Island at the mouth of the Altamaha River, McIntosh County. This small treeless island has been the subject of ornithological observation since the mid-1950s (Kale 1967; Kale and Teal 1958; Kale et al. 1965; and others). Previous observers report the nesting of Black Skimmers, Royal, Least and Gull-billed Terns, American Oyster-catcher, Wilson Plovers, Willets, and Boat-tailed Grackles. Seven trips were made to this island from mid-April to the second week of August 1970. No evidence of nesting by any of the above species was noted. In late April and early May several small, scooped depressions in the sand were observed but no eggs or young were located. This island appears to receive considerable use as a picnic area during the tern and skimmer nesting season. Until this activity is eliminated or reduced, it is doubtful if nesting will occur. The Black Skimmer component of this colony has moved to an isolated beach on Little St. Simons Island. ERICHSEN, W. J. 1921. 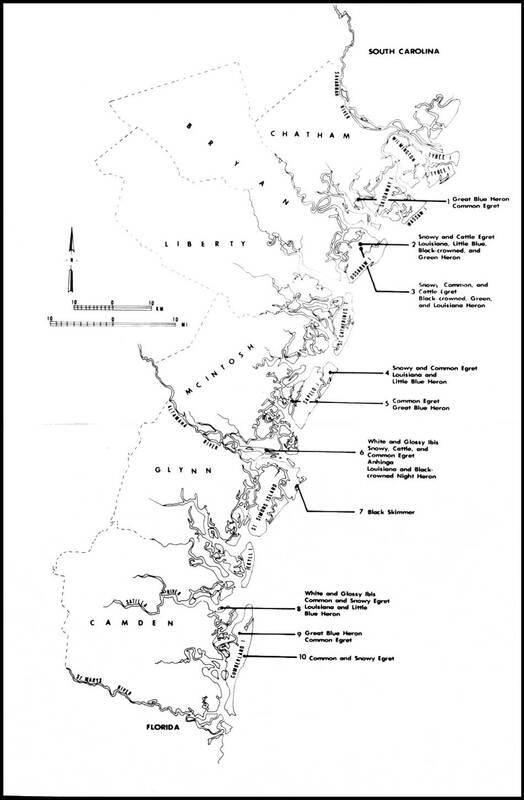 Notes on the habits of the breeding water birds of Chatham County, Georgia. Wilson Bull. 33(1):16-28, (2):69a-82. KALE, H. W. II. 1965. Nesting predation by herons in a Georgia heronry. Oriole 30(1):69-70. _______. 1967. Recoveries of Black Skimmers banded on Little Egg Island, Georgia. Oriole 32(2):13-16.
, G. W. Sciple, and I. R. Tomkins. 1965. The Royal Tern colony of Little Egg Island, Georgia. Birdbanding 36(1):21-27. ______, and J. M. Teal. 1958. Royal Tern nesting on Little Egg Island. Oriole 23 (1):36-37.